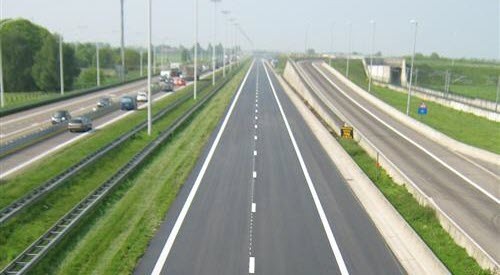 Resurfacing of motorway E19 at Meer – close to the border with the Netherlands – called for the use of enhanced performance asphalt. Work had to take place with minimum disruption to busy traffic flows between countries. Nypol 68 is a polymer modified bitumen and is produced according to EN 14023. Nypol 68 was chosen as the asphalt binder because of its enhanced performance characteristics. A well managed bitumen supply and delivery programme was vital to avoid disruption to a very busy motorway. Work was carried out in two phases and continued uninterrupted over weekends and holidays to reduce the overall duration of the contract and minimise disruption. Around 815t of Nypol 68 was delivered for the two phases. Phase one of the contract saw resurfacing take place over a 7km length and 12m width of the E19 between Meer and Loenhout. Approximately 17,000t of asphalt was removed over four days prior to the manufacture and laying of 12,000t of asphalt base layer over three days. Five thousand tonnes of surface course containing the Polymer Modified Bitumen (PMB) was then laid in one day, followed by the application of road markings and completion of signing for the next phase. Phase two involved the resurfacing of 8km of the E19 between Loenhout and Brecht. Approximately 20,000t were removed over four days; 14,000t of asphalt base layer were manufactured and laid over four days and 6000t of surface course containing the PMB were laid over two consecutive days. Road markings were applied and signing removed. Asphalt removed from the existing carriageway was partly re-used in the new construction. Base course material was of type AB-3A and the surface course was SMA-C2. This top layer was applied using three spreaders working alongside one another over the completed width of 12m. Accurate planning and sufficient tank capacity at the refinery were essential to ensure smooth processing and delivery of the Nypol 68 binder. This was necessary because of the high volume of PMB required: around 415t of PMB per day over two days, with an interval in between of one week. Download this information on how Nypol 68 was used at E19, Meer, Belgium, as pdf.